Again, hoping to see more aspen, J and I took a (long) day-trip down to Mt. Ouray. Mt. Ouray is a centennial 13er at the Southern end of the Sawatch range. I had it on 'the list' for awhile since it was scenic, high, and uncrowded, and had an interesting route through bristlecone forest, an open mountain cirque, and then a gorgeous ridge to the top. Anyway, for the second wknd in a row, we headed down 285, south past Poncha Springs. Now that it was daylight, with a waning gibbous moon waning gibbously, we could see Mt. Ouray from several miles away. Nice. I like mountains that look cool from a distance, have a decent prominence, and when you hike in the direction of their best presentation, so you can stare at it for hours. J started asking if the steepness relented -- it's pretty much 1k/mile the whole way -- and wasn't too happy with how hot it was for the end of September, when I was paranoid about having gloves, hat, etc. I tried to offer my sympathy, but since I was shirtless already, it probably wasn't too helpful. Permanent note to J: non-cotton t-shirt or tank-top is *never* a bad layer to have! ...in no small part because it reminds me of "The Legend of Zelda"
Just a bit further up, and the entire cirque was visible, called the "Devil's Armchair." Mt. Ouray is the high point in the middle. This route finds the easiest path up to the saddle to the left of the summit. To the right (Northeast of Mt. Ouray) is a big heap of scree that can serve as an alternative route along its shoulder. A descent there would make a fabulous Tour d'Ouray, but J called "no scree" so we didn't head that way. Anyway, the half-mile grunt up to the saddle is a mixture of talus, faint trail, and tundra ramp. Take your pick! We wound our way up to the ridge, leisurely. Did I mention there was essentially no wind and no clouds? Awesome weather. Once on the ridge, there was a faint climbing trail that zigzagged through the talus. Some bad news, though: several obvious false summits. I tried to remind J how quickly each little hump went by, 10-15 minutes or so, then the next one. Just moving forward. The trail actually winds around the backside of the ridge now, exposing new views to the West. Here, we actually saw a group of people descending. I apologized for 'crowding' the mountain, but we all laughed at the great day. And pushed forward, one hump of talus at a time. Finally, the summit was achieved. We shared the summit with a group of women, friends from various parts of the state that met to climb some 13ers the day before (Webster Pass ridge run to Horseshoe), then had taken the East ridge route (back side of the cirque) up to Mt. Ouray, while their respective husbands were toiling away at respective home projects. J and I were able to sit right on the summit for half an hour, enjoying leftover pizza and Red Bull. Heaven! J's spirits were better now and she enjoyed the descent, which is good as I worried I had pushed her into a longer hike and she wasn't enjoying it. I told her we went to 13,970+ feet, so basically 14 -- she had thought the whole time that we were on a 14er (since I was telling her about advantages/disadvantages of some options the night before). I told her we were less than 30 feet short -- also, note the lack of people -- did that bother or affect anything at all? "No," she replied, and I love her for it. Then she admitted enjoying the hike, but she's ready for some more "rolling, over the river and through the woods" hikes instead. I know what she means. As I mentioned, we ended up going past the saddle and just decided to head straight down the talus. No biggie, a little slower but somewhat shorter and more interesting. Back into the gulch by line of sight, and we picked the trail up again. End of September, and we were both sunburned! We looked forward to reaching treeline in this direction as well. Even though it was windless, it seemed like the trail was more covered in solid leaves, so you could "sense" a trail was there more than you could actually see it. ...before the planned apres-hike food and drink at Eddyline. Yum! A great day in the mountains with my favorite girl, how lucky can I be, 2 days before our 8th wedding anniversary! Mid-September, time to see some aspen. This is our 5th Colorado autumn, and I don't think I'll ever get over it. The cool, crisp air; infinitely blue skies; and blazing yellow aspen on the mountainsides. I guess I missed this season altogether when we lived in San Diego, so I don't take it for granted anymore. Otherwise, folks rave about the palette of colour back East. I'm not inclined to disagree, and certainly enjoyed that growing up in Wisconsin, but for my money, I'll still take the Colorado gold. Unfortunately, with school and all, we're limited to day-trips. One of the most reliable spots closer to Denver is the Kenosha Mountains (coincidentally named with a Wisconsin connection). I've enjoyed the famous Kenosha-to-Georgia pass mt. bike ride a few years ago in October, after the leaves had mostly fallen as well as a dusting of snow. This time, we'd head into the Lost Creek Wilderness for a leisurely day-hike. I knew that this area held lots of potential for easy travel on long above-treeline ridges in relative solitude, so I was anxious to get to explore. J, along with friends Ben and Bailey, were looking for a day-trip hike of similar caliber, so it worked out well for us to head up on a glorious morning. Then, over the pass, around that glorious curve of Hwy 285 south of the pass (I had a friend remark once how he enjoyed that section of road, and having thought the same thing, I now wonder how many other people can picture what I'm talking about), we soon hit Lost Park Rd, new terrain of dirt road heading east. The road was passable in the Outback, probably doable in a slow 2WD car, but I was grateful for sufficient clearance in some of the ruts. At one point, the car was tipped pretty far sideways and everyone leaned in the opposite direction, but it takes a lot to tip a car over. Right? Headed up, and up, with some great views to the West. Anyway, we stopped at the campground about a half mile from the TH. Good parking (and camping) spot. Headed up the road, then onto the trail. The trail was easy to follow, mostly buff with a few creek crossings. There were some interesting bouldering opportunities early, so definitely worth spending some time here. Otherwise, through the forest, up a short, steeper section of switchbacks, and then above treeline, with a thicket of willows to the right of the trail. To get to "Kenosha Pk", leave the trail just after the views open up after the switchbacks. As suggested on Summitpost, heading further up the trail, then arcing back uphill makes it easier to avoid most of the willows. There's a small ridge that does exactly that, so it's easy to head for the ridge and follow it up to the Peak. This is an open expanse of tundra with great views and a long ridge of other peaks in each direction. Yes, this is a great ridge run, and many have done exactly that. In our case, we hadn't seen anyone on our way up to the top. On the way back down, we went more directly through the willows, as it was easy to see the trail intersection, and there were numerous game trails winding through them. Going back down, Ben and I impatiently ran the switchbacks and some other fun stuff. In short, this whole trail is eminently runnable. If you wanted to run, some great options would be an out-and-back on the Ben Tyler trail (note that the Northern TH is very easy to get to, closer to Denver and right off of Hwy 285), as well as off-trail ridge run possibilities. We saw 2 parties on our way down, on a glorious day. Oh, at the bottom was a family having a picnic near their truck, right at the trailhead. An aluminum can (can't remember if it was beer or soda now, though it would be a better story if it were beer so I should just say that) was sitting right in the middle of the trail, and a young boy at the bottom was doing...something. After we passed, he resumed: shooting at the can with a BB gun. Now I know the (lack of) power of a BB gun, I grew up with guns and have enjoyed shooting in the past, so I'm not an irrational gun-phobe, but this just seemed like, uh, one of those teachable moments (even though they were armed). I mean, shooting up a trail of all things? So I quietly asked Dad if he thought it might be a better idea to shoot in a different direction (Rule #1: Don't tell some dude what to do. Rule #2: Don't chew him out in front of his family)...luckily he agreed and asked little Johnny to move the can. Phew. I had some time on a beautiul weekday afternoon and access to the car, so went to check out Centennial Cone in Jefferson County, which has been on the list for awhile. My friend Aric mentioned several years ago that I'd like it, and it didn't disappoint. But, due to use, it has a weekend alternate-use schedule (odd days hike, even days bike), so it just seemed like a good one to check out on a weekday. 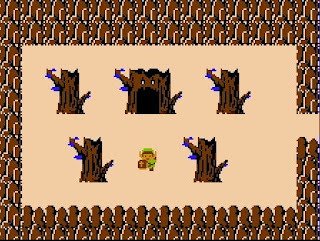 Although there are several parking lots, I started at Mayhem Gulch and did a clockwise loop, which means you start with a solid 20-30 minute climb. I recommend starting from that lot so you hit all the trails. I couldn't discern a noticeable "better" direction ride the loop once you're on it -- it looked like there were fun features in both directions -- so I think I'll try it CC next time. The only bummer spots are tight switchbacks with water bars on either side of Elk Creek, and some of the unshaded spots could probably get pretty hot. I'd like to come do this on a cool morning sometime. Otherwise, there are definitely some fun, rolling smooth sections where you can get some speed. Feels more like So Cal riding than Front Range for the most part. I think I prefer Buffalo Creek a tad more for scenic variety and a bit more length, but sand is much less of an issue here: the sandy spots are not too deep and are on straightaways when you still have speed, just blast straight through! Unlike what I just said about Bergen Peak, would I trail run here? Or hike? Probably not so much, at least as a loop, as the Elk Range and Mayhem sections are fun, long gradual smooth downhills on a bike, but not as interesting on foot. I would probably focus on the Travois trail section for running, as it's shaded and a tad steeper. A good ride overall, great on a weekday. Fall colours starting to show a bit in the underbrush and some of the trees. I only had time for a few hours to get outside -- and needed it -- so I checked out Bergen Peak near Evergreen. Bummer to have to drive 45 minutes to get to some decent foothills, but it is a gorgeous area. I'll be back with the road bike sometime, and it has great duathlon possibilities. Didn't go particularly fast and had to check the map a few times, but did the Bergen Peak trail race 11.5 mile loop. I did enjoy the terrain quite a bit, as it was all very runnable. I feel a bit sluggish mostly just from not having run as much, but I don't think there's much lingering from the 100-miler, so that's nice. Saw some mt. bikers on the top who were kind enough to take a picture. "What are you training for?" one asked. A natural question, I guess, so I answered something about the Denver marathon, but the simple truth is and always will be nothing -- I'm out here because it's gorgeous out and fun! Having signed up for a marathon maybe makes me want to run a bit more regularly and try to get some speed up (not too hopeful on that right now), but in other respects I wish I weren't signed up for anything. I headed down and told them I'd keep an ear open and let them pass, as they were planning on heading down the same trail as me. "You'd better!" one of the ladies joked, implying I'd get run over. I didn't run particularly fast, but there are enough switchbacks and occasional steps to slow bikes down, so they never actually caught up. Definitely worth revisiting here and maybe running a double or something. Because of the switchbacks and shorter distance versus the drive, I like it more as a running route than mt. biking. 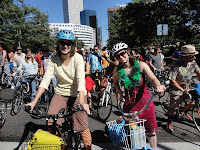 Headed out to Denver TdF on a gorgeous Saturday morning, meeting our friends Will and Mara. But, easier to fit in with minimal costumes in Denver than in the Fort. How do they compare? Denver is way more subdued: less intricate and interesting costumes, overall. It's just as packed at the festival itself, it seems. 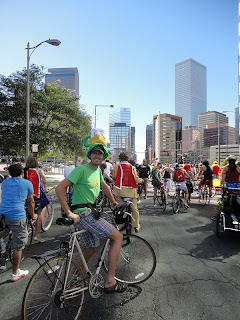 The Denver route is pretty fun because you go down city streets through the heart of downtown, where you might not ride a bike as easily during the day. Not as much energy as in the Fort. 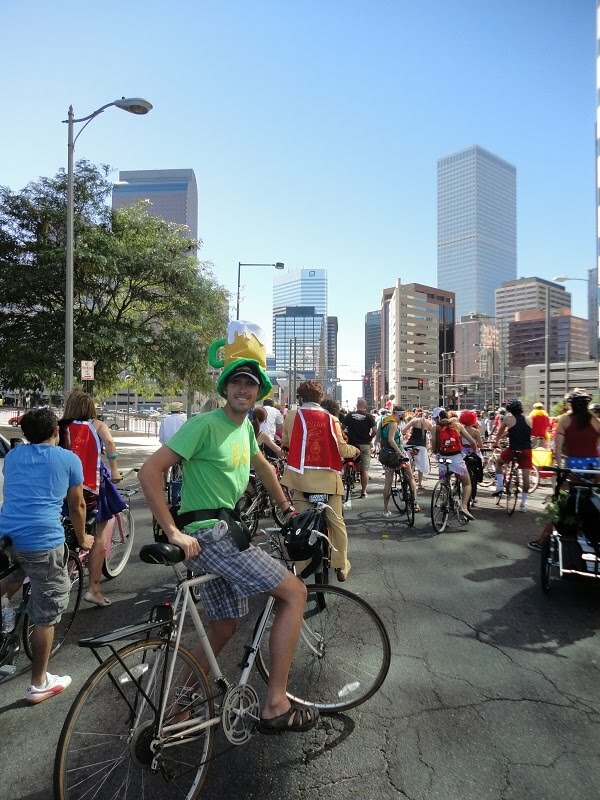 Then again, we saw the Tempe/Phoenix TdF before, and it was very small in comparison. For that aspect, I would recommend an interested person checking it out at the mothership itself if you can. That said, I feel like much of the Fort spectacle is out-of-towners and CSU folk, as a destination. I feel like the other towns attract people that have/ride bikes and join in the parade, whereas the Fort one has a lot of people driving in bikes from out of town. Had some great food from Water Course at TdF, good veggie stuff. Note to self, a list of interesting mountains and routes above 10k feet (sorry, lower peaks!). Class 3 or less. I come across interesting trip reports and don't want to forget, and I spend an hour or two debating routes depending on the situation. Hopefully this will help. Mt. Silverheels: East ridge, class 1+, 10 miles, 3522. Runnable? But powerlines visible on hike? Mt. Oklahoma -- has a steep scree section that some may not like. Redcloud : gorgeous colour. Standard OK, then descend scree. Sneffels: Looks cool. SW Ridge II? Castle and Conundrum: Looks like doable in Elks. But, combo? Snowmass: Lake sure is pretty. Loose rock. Maybe. - cuz it looks over BV. Just not sure about crowded standard route. Combo with mt. bike? I ran, today. 20 minutes. Slow and stiff, but arguably a running motion. This is not a training blog or daily diary, but in case I or anyone else wants a data point, my legs were just too stiff to run or risk anything for 5 days. And that was perfectly fine with me! 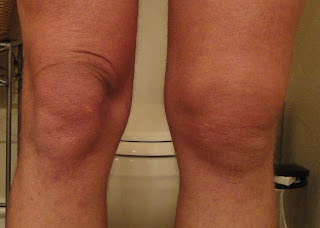 The 'swollen knee' was just general inflammation from a trashed quadriceps and maybe some knee tendon strain. Thanks DJ (NP) and Andrea (PT) for similar advice/observations/reassurance. The fact that I just 'stopped' running and then lay perfectly horizontal at night certainly didn't help, but I really didn't feel like I could have done anything else immediately. It hurt so bad the first day that I had much trouble lifting my leg into or out of the car. Worse in the morning/getting up after sitting down. The first day, I couldn't straighten my leg, and bought a $10 cane from Walgreen's to get around school. Ugh. Each day my leg felt better, I was able to bend it back more and finally bend it all the way yesterday (4 days later). Starting day 2, I generally walked a mile or so around campus, and biked around 10 miles or so. That seemed to help, and biking wasn't inhibited. A deep quad massage probably woulda helped a little more, J worked out some knots, I did some occasionally, and took some hot baths and hot tub. Those are my observations. YMMV. I'm only going to slowly add miles by feel, no rush. Hailing from Minnesota, the band "Cloud Cult" is one of my wife and my favorite bands. They're a fine bunch of musicians, artists, and general human beings. Most of the songs crescendo from simple beginnings to a full-on whirlwind of sound and emotion, which can carry you away if you feel like you're on the same wavelength. "Take Your Medicine" has long been one of my favorite running songs (that is, songs that remind me of running and why I enjoy it). Thanks for the super kind words. And congratulations on accomplishing such an amazing feat! I can't imagine how tasking that has to be on the body. Absolutely incredible. As an interesting note, I wrote most of that song during my morning runs last summer. See you in Denver! I didn't know about him writing it during morning runs...but it makes perfect sense. I may have gotten lost, but I found exactly what I was looking for: challenging your body temporarily is fully worth uplifting your spirit permanently. I will not be able to properly convey all of the feelings and emotions of this -- I may make a feeble attempt in a separate post -- so this will mostly be a description of what went into the day. That's when I set up my drop bags. This is the first race I ever had/used a drop bag taken out onto the course, and when packing to get ready, I started cramming stuff in there. Mile 35/65 (outbound/inbound) and the turnaround is where I put most of my useful items. I had one pair of extra shoes, several pairs of extra socks, Vaseline, moleskin, extra gel, sunscreen, clothes/layers, a rainjacket, a couple head lamps, and batteries. Oh, and an Ensure and a Red Bull in each bag. This isn't a NASA mission, though, it's running -- supposed to be easy and simple! I ended up drinking some of the Red Bulls and using my head lamp. But it was nice to know the extra stuff was out there. For actually running (in case some Lean Horse runner is reading this in the future -- Welcome, future visitor! ), I had a visor and sunglasses, bandanna, long sleeve tech shirt, and some REI running shorts with 3 pockets. For socks, I went with some thin plain cotton Fort Collins cycling socks I got for free, and for shoes, I went with Brooks Ghost 3 road shoes. I debated on trail shoes here, but was happy with the Brooks, which had maybe 40 previous miles on them, which are also the same 40 miles I've ever run in those model of shoes, since it turns out my previous favorites, Mizuno Wave Riders, are gone for the year in size 9.5 2E. Anyway, it all worked out. There's a mixture of gear out there, from road to trail, and I'm saying you could go either way with whichever you're more comfortable with. For fluids, I reluctantly decided against my trusty Rusty Myers fishing jug (an oversized water bottle with a handle), and instead went with 2 standard bike bottles with homemade duct-tape handles. The thinking went like this: first, $20 each for simple handhelds is a lot when I had a dozen or so regular bottles sitting at home; and 2 bottles of fluid would exceed what I'd need between aid stations, but would give me the opportunity to dump water on my head to stay cool, based on high temperatures forecasted in the 90s. I was very happy with this decision, and pleased that the duct tape held up all day. We headed up north across the vast barren vastness of southern Wyoming on Friday morning, stopped for lunch in Subway (Torrington, maybe? ), and then rolled into Hot Springs around 1:30 or so. Hot Springs is a quaint town, with a great little independent bookshop (The Wild Burro), and a choice of some basic restaurants and hotels. A bike path and river runs through the middle of town, and a year-round waterfall drops into it. We headed to the Mueller Center to check in, drop off the drop-bags, and listen to Jerry give the pre-race briefing. Here, I was happy to meet up with friends Chris and Alex, and meet a few other folks as we mingled around. Nothing too exciting came out of the pre-race talk -- or should I have listened to course directions more carefully? -- but I enjoyed the general enthusiasm and nervous excitement of the crowd. And, we had a chance to hear about next year's Black Hills 100 race, which sounds like it will be a good one. After the meeting and checking into our hotel, it was time to carbo-load, so we went to China Buffet downtown and had an enjoyable dinner with Alex's family. Not sure if it was the most gourmet food in the world, but it seemed to do the trick for Alex and I, and I think his son may have out-eaten me, which is no small feat! We went for a short walk along the bike path, then headed back to the hotel. I didn't actually end up in bed until 9 or 9:30, and didn't sleep all that well. Finally, in the middle of the night/morning, I started getting some real sleep, and then my alarm went off at 4. I had a couple of Sunflower pop-tarts and some instant coffee, then kind of paced around and got ready, before Ean took us up to the race start. Wow, this was really happening! I laughed at being a bit anxious: what use was a little nervous energy going to be for the next 20 or more hours? Soon enough, we congregated at the start line. It was just cool enough to be comfortable in a long sleeve shirt. Alex and I started next to each other...and then, we were off! With his GPS watch, we were hitting 9.5-10 min/miles -- blazing fast for a 100! We headed up the road and bike path for our first mile (yes, I'm going to talk about every individual mile! ), where our hotel was located. Our families were out in pajamas to see us blaze past in a furious rush. Amazed, they headed back to bed, while we charged forward. Alex and I chatted and stayed loose for the first 3 miles or so. Nearing the first aid station, Alex got ready to use the restroom, and we exchanged well-wishes as I headed forward. By now, I no longer needed my shirt, and still had over 96 miles to go, but having a long sleeve makes it easy to tie around the waist. I went through the aid station with plenty of fluid, across a muddy and grassy two-track trail, and then turned left onto the (in)famous, hilly Argyle Road. We rolled up and down the hills, and I continued walking each and every uphill immediately. I actually felt like I was making good progress while speed-walking, and occasionally kept pace with runners. The hills continued for 13 miles as the day began to heat up, but enough high clouds were around to keep it from being unbearable. Still, I regretted slathering sunscreen over my body -- something I don't do regularly -- as my body heat felt trapped by an oily mask all over my torso. I hoped to sweat it off soon and didn't plan on re-applying any. I enjoyed some occasional chats with runners along the road, and mostly tried to settle into a pace. I met one runner from Quebec, and then saw Chris's friend Ryan Phillips, whom I met the day before, and enjoyed some occasional chatting with him. This helped these dirt road miles go by, and bring us into the 2nd aid station, which was the first one I stopped at. I focused on minimizing my time at the aid stations, by having my bottle tops off, asking them to be refilled, and then grabbing 2 gels (for my pockets), a handful of potato chips, and a 3rd of a banana. In the beginning, I was going with one bottle of Powerade, one of water, but I found that I hadn't been finishing all of my Powerade. After the 4th aid station, I switched to 2 waters (ice water if possible), and should have been doing this off the bat. Oh, one more thing: in addition to a few gels in my pocket, I had a 35mm film canister partly filled with salt (read this trick somewhere but don't remember where), along with some ibuprofen and some electrolyte tabs (I hadn't planned on the tablets, but then saw they had them for free at aid stations). Anyway, I was happy with my progress at the first few aid stations, which felt like they were around a minute or so. Things kept going according to plan as we headed off the Argyle Road onto the Mickelson trail after around 17 miles. This difference in terrain formed a nice psychological barrier. A couple more aid stations, and the first quarter would be done. Along the trail, I kept pace with Ivan and Jerry. Jerry had done a few Leadville's and had some good advice; this was Ivan's first. I asked Ivan if he realized we were going way too frickin' fast for this early in the run, he smiled and said he knew! We were now at the mile 24 aid station, and Jerry thought his pace was too fast as well. "Easy to fix that!" he said, as he planned to sit at the aid station. I, on the other hand, needed a bathroom right around now, and it was a convenient time, as the aid station was in a park with restrooms. I hit the aid station as well, then headed to Mile 25, right around 4:10, pretty much the same time I ran in the 50 two years ago. But, I was feeling OK.
Now I was in terra incognita, since miles 26-50 were on a further section of trail than the 50-miler. Another interesting psychological barrier. Just focused on getting to the next aid stations. I caught occasional glimpses of Ryan here, but the crowds had really thinned out. Mile 35 was another park and town, but then we were back onto the trail and more into the trees. We could also start seeing Crazy Horse Monument in the distance. This was an enjoyable woodsy portion of the course, with one problem: the aid station seemed awfully strung out. And here I hit a low point, starting between mile 35 and 40. I just felt kind of sluggish, and didn't feel like running after I walked up a hill. My pace wasn't that much slower, and I kept it based on feel, knowing I had a long day ahead. A few spots the sun poked out and baked down on us, and I could feel my heart beating -- at those points, I slowed immediately, as I should never feel my heart pounding in my ears that early. Interestingly, this is where I hit a low in Collegiate Peaks early this year, but never really recovered. I made sure to keep taking a gel every half an hour and just kept working, even though I wasn't particularly hungry and my stomach felt flat. Not nauseous, just not hungry. I had read somewhere, "Don't worry about hitting a low point in a 100-mile race...EXPECT that you'll have two or three low points!" So I just kept at it. I had some pain in my legs, and took some ibuprofen, something I rarely do otherwise. I knew I had more than 50 miles left, but tried not to think about it. Although my pace had slowed, I was still on pace for my first half target goal, which was kind of built into the plan. I knew Neil would be waiting at the turnaround, and possibly the ladies, so I had that to look forward to. I figured I should look alright at the turnaround, so I walked a bit more and just saved some energy. Then, just a few miles before the turnaround, it happened. I had heard about it, read about it, and hoped for it, but had never experienced it previously. I came back from the dead. It was simply amazing, but somehow, my body and mind figured out what the heck was going on, and decided to stop protesting. And I felt fresh and wonderful. Within another mile, I saw Ryan again, and heard voices of a small crowd gathered at the Mile 49.2 aid station. There I saw J and Deb, Neil and DJ. "Be right back!" and I snuck a kiss from Jess. I surged ahead to catch up to Ryan, and told him about coming back from the dead. He appeared to be suffering a bit, about the same as I had just felt. "C'mon man, let's get that turnaround and head home!" I told him. I had hoped to pick him up a bit, so I hope my enthusiasm wasn't annoying instead, but we hit the turnaround and he paused a bit as I headed back. 50 miles and heading home! It turns out I was now in 5th place, which greatly exceeded my expectations. I knew the first 2 guys were way out ahead and looked strong, and one of the other ones looked like he was working pretty hard. I wasn't looking for a specific place, but I would like to try to defend my position and pick up spots if possible, mostly as a sign of running a solidly paced race. I saw the crowd again and picked up Neil, and told him we had work to do. He had my drop bag but I didn't really need anything other than Red Bull on ice, and we headed out. I told him about coming back from the dead. "This is temporary," I warned him, "and it might happen once or twice more." Nonetheless, it was great to see him. He hopped on his mountain bike to pace. Just a week or two ago, Neil offered to pace on bike. This is highly unusual for a 100-mile race, which is usually either too technical or narrow for mt. bike traffic (mountain courses), or too boring or unnecessary (loop courses). We asked Chris and Jerry about it, and got the OK. Chris said a random mt. biker paced a woman previously and it worked out well for both of them. I'm surprised it's not more popular. I made up some 'rules': no aid from Neil other than help at aid stations; no muleing of my supplies; we would stay next to each other, not him in front, which would be more like 'drafting' and less like 'equals', although he should drop behind me for oncoming traffic; and I still needed to bring/use my own headlamp if needed. I was ecstatic to have Neil on the course with me. As I mentioned in a previous post, he helped kick off some endurance interest by running my first half marathon with me, and riding my first bike century with me. If he hadn't had some health challenges that would have left 99.9% of the rest of the world at home, he'd probably be running the darn thing. As it is, he's the perfect pacer and crew member. He's worked logistics for several companies, which means he's great at envisioning the big picture and reacting, quickly, to problems. He's got a great sense of humor, and he's fluent enough in telling jokes in several languages, in case any crazy Catalan runners are nearby. In general, he's never at a loss for words. And he graciously and selflessly has put up with my crap in the past (he just helped us move! ), and outdid himself here. What's big, red, and eats rocks? It turns out that the answer to this 'riddle' is as pointless as running 100 miles is anyway. But it was something to think about, which Neil would bring up just as I had begun to forget it. We hit the next aid station, then slogged up toward the Mountain aid station. That tough little section was done. They told me I was gaining on 4th place, who lingered in the aid stations. This got me moving again and we looked forward to the next drop bag. More chatting and focusing on the next aid station, where I looked forward to another Red Bull. Stayed on target with Neil's help, and then saw 4th place, a runner from Lawrence, KS, as he was getting to head out, along with a female runner (but not competitor) from NY, whom we had seen on the course earlier. Turns out, she had come out to support a friend who DNF'ed, so she was just out jogging. We told Lawrence to get up and get going, and we soon had a little party. The NY runner only had a mile or two before she peeled off, so we chatted with Lawrence. This was his 2nd 100 miler of the year and of his young career (after Kettle Moraine), he was aiming for 16(!) hours and ran into incredible back pain which has plagued him occasionally. He absolutely wanted to finish, though, but was hoping to hold on. He liked our run/walk pacing and kept up, though my walk pace remain fast while he jogged, and my run pace was certainly slower than what he'd done all day. We all chatted for a bit and got to the next aid station together. I got ready quickly and didn't want to linger, so I headed off, seeing if he would come out and catch up, but he took some more time there (ultimately, he did still finish). Where are we? Ahh, 70 miles in, more than 2/3rds of the way done. Amazing. Aid station to aid station, man. Mile 76, drop bag: ditched sunglasses for headlamp, another Red Bull (btw, this is just one cup's worth, not even a full can, just enough to get a good few sips on ice). I remembered looking at my watch earlier and seeing around 13 hours -- that meant 5 or 6 or 17 more hours to go. I consciously squelched those thoughts, and focused on moving ahead. The sun was setting as some clouds rolled in, and lightning flashed in the distance -- the perfect distance, as it turns out, as it never got close enough to be worrisome, but just close enough to put on a show. As dusk approached, saw numerous deer as well as buffalo. Some thicker clouds rolled in with an occasional refreshing sprinkle. Mile 80, another great milestone, and then almost done with the trail section and back to the road. We saw a sliver of orange moon disappear behind the clouds, and it was quite dark in the open as we neared Argyle loop. Here I paused and had trouble finding the turn toward the next aid station: I was fooled by a gated driveway with lamp lights. We headed straight ahead and the turn was well-marked, I was surprised because I expected the lights from the aid station to beckon me from afar, but it wasn't visible until we were right on top of it. Instead, they tempted us with an inviting campfire: what a lovely place to hang out for the night! But we kept on moving. I don't remember where it was, but at some point I learned that I was now in 3rd place, due to a drop somewhere. Holy cats. That's another magic number that I felt good and protective about. I looked over my shoulder occasionally for headlamps as it got dark enough for us to need ours, and we headed down Argyle Road. Again, walk the uphills quickly, run the downhills. Mile 85, then 90: the last frontier. One more aid station, I'd be off this road, and then the homestretch. On our way to Mile 95, a car approached us, in the middle of nowhere. "I think that's ours!" said Neil. Sure enough, the womenfolk were in the Subaru. I quickened my pace and kept on going as he gave them updates. It was great seeing them out there, I waved and kept on, not very emotional, more machine than man. We saw the elusive yellow Mile 95 sign. I wasn't as elated as I thought I'd be, and I wasn't unduly suffering: just finish the mission. It was 17:29 on my watch. One more hour of 12 minute miles (should be doable on a net downhill) and I'd be sub 18:30! I mentioned this to Neil, kept a straight face, and moved ahead. Too far ahead, as it turned out, and all hell broke loose. I just kept doing Argyle hills. Straight ahead, hill after hill after hill. I wasn't sleepy, I wasn't disoriented, I was just a machine that ran Argyle hills, like the Subaru had before me. Until I ran out of road when I hit the highway. I was off-course. I couldn't believe it. I had to explain to Neil how we came out. I hadn't warned him about a turn, nor had I been thinking about it. I was a machine, that ran straight ahead, hill after hill after hill. I wasn't thinking about turning. In my head, I had thought that we had run the entire length of Argyle Rd, and that Argyle Rd went past the aid station. Neil had a GPS, we scrolled around. "Cemetery Road, I need to go there...Evans Plunge...." I tossed out random words and phrases. I started explaining the two-track trail near the aid station, and the reservoir. Amazingly, we stayed down there figuring out what was going on, rather than heading back immediately. Minutes went by. "Should we call someone?" I asked. This made no sense. I had the gooey, correct thought in my head, but I didn't articulate it. Neil did. "We need to go back to Mile 95 and figure out what we missed." Duh! But my mind blocked that out as it tried to rationalize against admitting running extra miles. We headed up and throughly checked some driveways to the left. Nothing. But the aid station had to be within a half mile of the road! I shouted at the top of my lungs. "HEEELLLLOOO!" No reply. "AIIIIIDDD STAAAAATIOOOONNNNNN!" No reply. I stuttered, stopped, started, and kept going up the hill to another 'driveway'. Neil found it. "Here it is" -- he saw the flags, which marked a double-track cut through grass and brush. Unfortunately, the yard sale flags were on the uphill side of the track, so they're not visible from above. There were a few glow rings on the track, at least one of them dead, and only visible after you made the turn. Or, to be fair, everything would have been fully visible if you consciously turned to look for it, which I could have/should have done. My kingdom for a single orange cone! I bent down, painfully, and tossed a glow ring onto Argyle Road for the next person. I thought I lost 20 minutes at least, but now in my weird time warp, I later learned I went 2.5 miles out of my way, so it was at least a half hour. I was certain that dozens of people had now passed me. It wasn't strictly my goal, but it seemed like a bummer for all that work. Neil mentioned this to the aid station guys. "Aw, man, we told 'em we should mark that so people don't miss it!" They felt bad, but shouldn't: someone did mark it, just not knowing what mistakes a goopy, tired brain can make. "Well, how many people passed through so far?" I couldn't believe it, half an hour of messing around and nobody nearby. Well I was sure a horde was behind me, so I kept looking over my shoulder. "Dude, I don't think anyone's within an hour of us," Neil reassured me, but I didn't believe him. Finally, pavement, downhill, downtown. This section can be confusing, but was very well marked. Somewhere in here, over 2 miles from the finish, I knew I had run my first 100 miles. But I had a finish line to find! 19 hours ticked over, unfortunately, so I couldn't say 18-something. But it's all made-up anyhow. It was just even pacing now, no tricks. A house party was going on and offered us beer. Machine. Mission. The lights of the Mueller Center. Neil rode up ahead. The girls were waiting. There was some sort of clock, with its time in my world -- elapsed time. Soon it would stop, for me, and I would be back in Earth time. I don't feel like running anymore. Alrighty, working on the race report -- school takes first priority though! Couple days letter, everything's healing...except for my left knee! Immediately after I stopped running, my left leg became sore and painful in the quadriceps and knee area (the run ends with a paved downhill, among the other downhills). 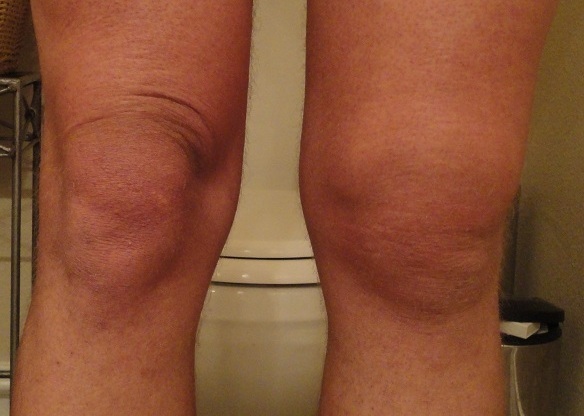 Standing up, I clearly have a fluid buildup *above* the knee (suprapatellar, as opposed to on top of the kneecap itself). My lower left quad is somewhat painful but not any more than expected. Q for the masses: Any experience here? Suggestions? Looking like bursitis, just curious about any ways to make it heal faster, and if it represents any other tendon damage. Doesn't feel like it, I can bear weight. Every day gets better/less painful, but the swelling isn't going down much. Yeah, been R.I.C.E'ing and ibuprofening. Haven't seen this listed enough after marathons/ultras like I might think, mostly listed from traumatic knee impact and people with poor circulation, who are usually willing to put up with it for weeks or months as long as they can watch sports on television rather than asking much out of their bodies, so I'm looking more from a sports injury point-of-view. Are my tight quads preventing proper/quick drainage from the lymphatic system? Should I get it drained or wait it out? This totally went away by itself after 2 weeks. The first couple of days, I couldn't walk without a cane(!). I didn't run the first week and part of the second week. By the end of the first week, the swelling started going down, and really started getting better the second week. Nothing was permanently damaged -- I think the quads were just thrashed and healing just above the knee.